Made by Marsden, Elisabeth in New South Wales, Australia, 1802-1803. A boy's dress made from red unbleached cotton that has been printed with a white geometric pattern. The dress has a high standing collar trimmed with a ruffle and long straight sleeves. The high waist of the dress has a drawstring through it. The dress opens down the centre front, finishing at the high waist in the dress. The opening fastens at the collar with a dorset thread button. French seams sewn in white thread can be seen in the dress. The darned and faded fabric and its pieced construction suggest that the dress was cut down from another garment and worn as everyday wear. The dress has a high neck band trimmed with ruffle and fastened with dorset thread button, and long straight sleeves. The garment is particularly modest considering the status of the Marsden family, as printed cotton was typically worn by poor children, with children of the privileged commonly dressed in white muslin. The dress has a high waist, gathered with drawstring, and as was common during this period mirrors the fashion of women's costumes. The French seams, stitched in white thread, although very fine in places are irregular in stitch. It is likely that the dress was made by John Marsden's mother, Elizabeth Marsden. This dress was worn by John Marsden (1801 - 1803) when he died after being scalded by boiling water in the Marsden's kitchen in August 1803. This dress, along with other costumes in the Marsden collection, was given to the Royal Australian Historical Society in 1919 by the executors of the estate of Eliza Hassall (2/11/1834 - 26/12/1917). Eliza was the daughter of Reverend Thomas Hassall and Ann Hassall (nee Marsden), born in 1834, and a granddaughter of Samuel Marsden. The garments were exhibited during the Society's 1920 Exhibition, along with subsequent exhibitions. 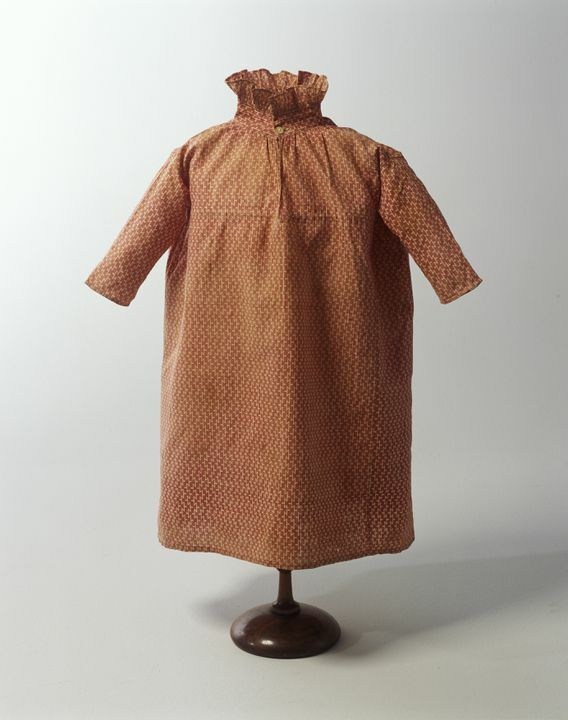 A note accompanying the dress, believed to have been written by Eliza Hassall, states: 'The dress Grandmother's little Son had on when he fell into a pot of boiling water and died at the Parsonage'. The Marsden costume collection was donated to the Museum in 1981.